My only contact in Chile came good. I met Marianela Rosas at the bus terminal and we walked across the Pedro de Valdivia Bridge over the rio Valdivia, to the island of Teja, the northern portion of which is occupied by the campus of the Universidad Austral de Chile. 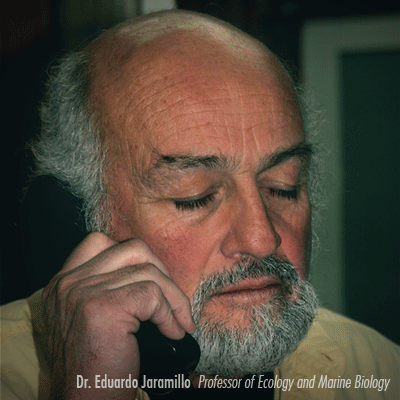 She had arranged a meeting with Dr. Eduardo Jaramillo, Professor of Ecology and Marine Biology, the man in charge of the ecotoxicological monitoring programme in the rio Cruces Sanctuary. This was my chance to find out what really happened to the ecology of the wetlands from the man who verified the cause of the ecological collapse. Fortuitously, Professor Jaramillo spoke excellent English, having gained his PhD in Zoology at the University of New Hampshire in the USA, so that I did not have to rely on Marianela to translate. With that barrier dissolved, I was also relieved that the expected barrier of formality did not exist. Having picked up on Marianela’s deference to the rank of Professor prior to our meeting at the university, I had assumed that a high degree of cultural formality existed in Chile, such as one customarily experiences in Japan and parts of Europe. However, dressed casually in an open necked yellow shirt, Eduardo greeted me affably and devoted a substantial slice of the afternoon to explaining what had happened in the wetlands, despite being very busy as evidenced by the constant ringing of the phone. He solved that problem by taking the phone off the hook. I knelt on the floor next to him seated on a chair in front of a computer screen, as he scrolled through a very detailed presentation which he had prepared in English. At the conclusion I asked Eduardo if he would mind giving a summary for the camera. He agreed. I set up my camcorder on a tripod and he obligingly spoke for five and a half minutes. What follows is essentially that summary, with some extra and explanatory comments from me. What was missing from his summary, of necessity, was the detailed science of the ecotoxicological testing undertaken in the Sanctuary. 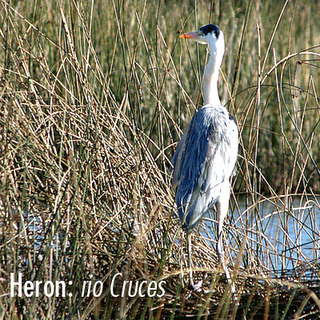 The Rio de Cruces Santuario de la Naturaleza is a wetlands site listed under the Ramsar Convention on Wetlands signed in the Iranian city of Ramsar in 1971. (Tasmania has ten Ramsar listings). Beginning on the rio Cruces next to the university, the Sanctuary extends 25 kilometres upstream, has an average width of 2 kilometres and an area of 4877 hectares. But prior to May 22nd 1960, the wetlands did not exist: the area was flat agricultural land through which meandered the rio Cruces. At 3.12pm on that fateful Sunday morning of May 22nd 1960, the most powerful earthquake ever recorded in the world, 9.5 on the Richter scale, struck the region, causing the rio Cruces valley to drop between 1.5 and 2 metres. The earthquake killed a few people in the city, but the resulting tsunami killed 5700 people and flooded the valley, creating the wetlands we know today. Two months after the tsunami, on July 25th, the Rinihue Lake collapsed and also flooded the valley, an event which happened once before in 1575. The first warning signs of an environmental problem occurred during late autumn and into winter 2004, when a dramatic decrease in the population of black-necked swans was noticed due to migration and an increase in mortality for unknown reasons. The second situation was the demise of the aquatic macrophyte, ‘Luchecillo’, (Egeria densa), the primary food of swans and other herbivorous birds, which occurred in the first trimester of 2004. Aerial photographs showed the extent of the denudation of the Sanctuary. This was followed in the spring of 2004 by brown water coming down out of the Sanctuary into the city. Again aerial photographs showed the dramatic difference between the clear waters of the rio Calle Calle and the brown waters of the rio Cruces. From the beginning the citizens of Valdivia pointed towards CELULOSA VALDIVIA (CELCO), a 555,000 tons/year pulp plant as the ultimate cause of the environmental changes. The plant is located 25 kilometres upstream from the northern boundary of the Sanctuary, that is, 50 kilometres from the city. US$80,000 was made available to establish the cause(s) of the ecological collapse. In three months 15 hypotheses were tested. Many were easy to reject, such as agricultural chemicals, because sampling showed such chemicals were absent from the wetlands. One hypothesis, advanced by a very passionate and wrong-headed individual, maintained that the plant decline had been caused by an increase in ultra-violet radiation. This hypothesis was easily disproved because the most advanced testing apparatus in all of Chile exists in Valdivia, and showed no change in ultra-violet radiation levels over a period of years, in addition to which, no other wetlands in the vicinity showed any adverse effects of anything. Despite overwhelming evidence, the individual persisted with his beliefs during a very memorable public brawl. However, rigorous sampling proved that wastewater effluent from the pulp mill was the cause. Luckily baseline studies had been done prior to the construction of the pulp mill. Armed with that data and with data from sampling taken upstream of the pulp mill effluent discharge site, it was easy to demonstrate that downstream of the pulp mill wastewater outlet, a huge increase in suspended solids and a huge increase in suspended heavy metals had occurred since the mill had begun operation, most notably iron (Fe), aluminium (Al) and manganese (Mn). The average increase over the baseline figures of these three metals is as follows: Fe increased, on average, by a factor of 5.7, Al by a little over 8 and Mn by a factor of 6. At some test sites, notably at Boca Nanihue, Cudico and Nanihue, the readings for each of the metals was near or over double the average increase. Further support for these findings, as if any was needed, was that when the pulp mill was closed down in January and April 2005 and ceased production, the presence of heavy metals in the water dramatically declined towards the baseline figures. Aluminium sulphate was used as a reagent at the mill as part of the physico-chemical treatment of the wastewater. In water the aluminium sulphate forms aluminium hydroxide (AlOH) which is a flocculant, causing particles to coagulate and drop out of suspension and be deposited on the bed of the wetlands. The depositional process was further aided by the hydraulic brake of the incoming tide. The high levels of chemicals such as sulphates, chlorines and heavy metals killed off the aquatic macrophytes. The Luchecillo, said Eduardo, turned into mucous. Autopsies of dead swans revealed a dramatic weight decrease in excess of 2kg for a normally healthy bird of 5-6kg, as well as a lack of muscular development in baby swans, which meant that even if by some fluke a bird grew to maturity it wouldn’t be able to fly. Autopsies of stomach contents of dead birds revealed the presence of no Luchecillo, nothing but sediment and parasites. What about dioxin poisoning? Because no dioxin testing equipment exists in Chile (just like Australia) there was no data available. What is your best guess as to the role dioxin contamination might play in the Sanctuary in the future, I asked Dr. Jaramillo? His answer was to the effect that dioxin is a poison that accumulates in the environment and therefore one can only assume that the environment will, in time, start showing the effects of that contamination. The carnivorous birds, such as the herons, which so far have escaped the effect of the eradication of the aquatic plant life, may well start showing the effects of dioxin poisoning.